Designed not just for travel, but for exploration, this 100-guest mega-yacht sails to the Galapagos Islands, one of the world’s last pristine environments, seven days a week, 365 days a year. 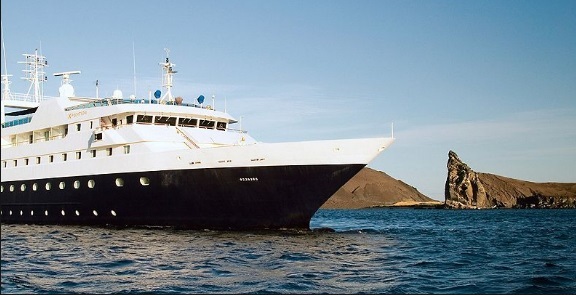 Our knowledgeable crew, environmentally sound ship design, and Galapagos National Park-certified onboard naturalists all help to preserve this delicate archipelago, while enlightening you to its natural and evolutionary significance. It’s a journey like no other. One of the two islands in the Galapagos with an airport. Española Island, part of the Galápagos Islands, is a popular tourist stop. Visitors are attracted by the variety of wildlife, most notably its avian population, its restored giant tortoise species, and plentiful sea lions. Nearly all of the bird species found on Española Island are visible at Punta Suarez, on the western end of the island, one of two main visitor sites. The population includes tame mocking birds, uncommon red and green -trimmed marine iguanas, both blue-footed and masked boobies, albatross colonies and more. The second site, Gardner Bay, is on the northeast side of the island. It offers one of the most spectacular beaches in the archipelago. It’s a good spot for swimming although snorkeling is better on nearby islets such as Tortuga. Here on Floreana Islands sits Post Office Bay … where 18th century whalers opened an unofficial post office in a barrel. It’s been in service ever since and the cost of postage has not gone up a single cent. Here is where the flamingos nest on towers of mud, but not before showing off their exquisite pink color circling the lagoon and landing. Off the coast of Floreana Island lies Islote (Isla) Campéon. Above the water, it seems nothing but a bare, rocky landmass, but diving under the surface reveals a spectacular underwater realm. Isabela Island is the largest of the Galapagos islands, on the western end of the archipelago. Shaped like a seahorse when viewed from above, Isabela is home to more wild tortoises than any other island, as well as a wide variety of other animal, bird and marine life. On Isabela’s west coast lies Tagus Cove, a natural protected harbor where centuries ago whalers safely spent the night and left their ships’ signatures painted on the rocks. Nearby, Moreno Point near Elizabeth Bay is a birdwatcher’s delight. Further inland, visitors will find six volcanoes, five of which are still active and two that sit directly on the Equator. At the base of Alcedo Volcano is Urbina Bay (also spelled “Urvina”), a great place for snorkeling and home to the biggest land iguanas in the Galapagos. To the north, located at the “mouth” of the island, is Punta Vicente Roca (Vicente Roca Point). Although it’s a marine-only site (meaning it can only be accessed via dinghy or SCUBA diving), the formation nonetheless draws plenty of visitors eager to see its spectacular sea life – penguins,seahorses, sea turtles, sunfish and more. Puerto Ayora is home to the Galapagos National Park, the Darwin Foundation and the Charles Darwin Research Station. Located on the southern shore of Santa Cruz, it’s the most populous town in the Galápagos Islands and has the best developed infrastructure. Santa Cruz Island is home to the Charles Darwin Research Station where you may learn about the breeding programs for the tortoises and land iguanas. Stroll through the town of Puerto Aroya to buy souvenirs. Bachas Beach, the first stop on many cruise itineraries, provides a delightful introduction to the Galapagos Islands. Sea turtles, red rock crabs, flamingos and more can be found nearby. On the northern shores, Black Turtle Cove is a secluded estuary with herons, pelicans, sea turtles and other wildlife finding sanctuary among the mangroves. In the highlands of Santa Cruz, the scenery continually changes as you ascend through all 7 vegetation zones. Visit a pair of large pit craters and the largest lava tunnels found in the Galapagos. On the uninhabited side of the island, visitors can hike inland to the site known as Dragon Hill, so called for the colossal yellow land iguanas that live here. On South Plaza Island, sea lions breed all along the low lying northern coast. These sheer cliffs are home for swallow-tail gulls and the beautiful red billed tropic birds. The landscape is dominated by optunia cactus trees. A look under each tree reveals a land iguana patiently waiting for a succulent cactus pad to fall. Celebrity Cruises Inc. reserves the right to change, whether via an increase or decrease, any published rates, including cruise rates and airfare charges, without prior notice. We reserve the right to impose on any existing booking or new bookings (whether paid in full or not) a supplement for fuel or other matters without prior notice as provided in our Passenger Ticket Contract. In addition, we reserve the right to pass through any third party imposed fuel or other surcharges, also without prior notice, The guest will remain liable for any applicable taxes, fees or surcharges that may be assessed by any governmental or quasi-governmental agencies.